I arrived in Santa Rosa last night to start shooting another season of Guy's Grocery Games for Food Network. The show is a ton of fun to do, but I have to say that from the second I get on the plane, my heart starts aching terribly for my babies. I simply can't stand being away from them for even a day. Knowing that I would be leaving town, I spent this past week making a ton of fun treats for my kids (and my hubby) to enjoy while I’m away. 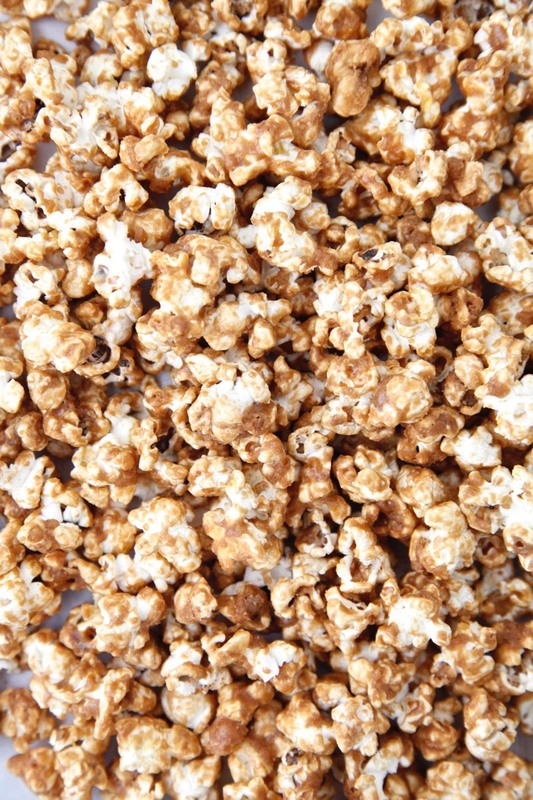 Caramel Popcorn was a childhood favorite of mine and it's quickly become one of Kenya and Chloe's as well. The first batch I made went over like gangbusters as neither kid had never tried it before. I brought little bags to school when I picked them up at the end of the day and they both shared it with their friends. There’s nothing like combining a gaggle of starving kids after a long day of school and a big bag of Caramel Popcorn -- what a ruckus (note to self_ next time bring more than two bags to school). For the longest time I avoided making my own caramel popcorn, thinking I would need to use a candy thermometer to make the caramel coating, but I realized by trying it that it’s so much easier than I had imagined. I just cooked up a delicious mixture of butter, brown sugar and vanilla until it was golden and bubbly before combining it with the popcorn and baking it till my kitchen smelled like total heaven. That first first whiff you take in is generally when you know it’s ready to go, but there’s an exact cook time in the recipe below to help you know for sure. 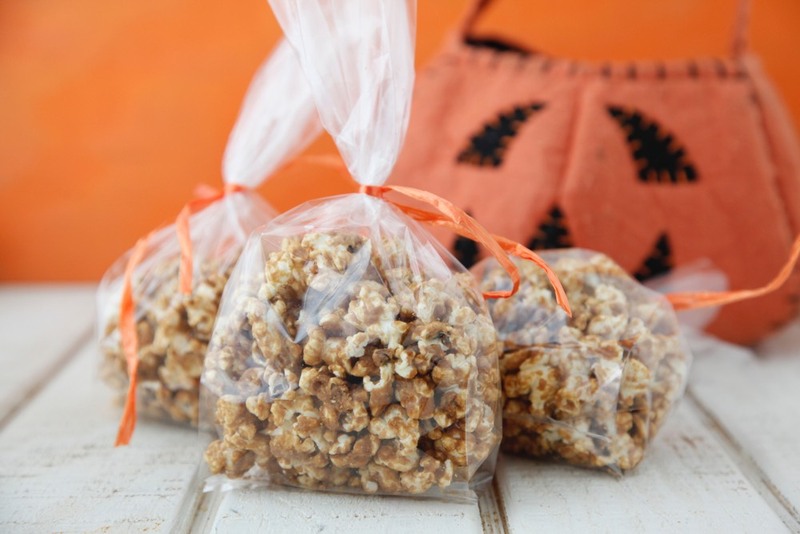 Instead of going to the store to buy Halloween candy to pass out to neighborhood trick or treaters, make up little bags filled with this irresistible Caramel Popcorn and keep the little ghosts and goblins happy all night long! 1. Preheat the oven to 250F. Line a baking sheet with a silpat or parchment paper before you begin cooking. 2. 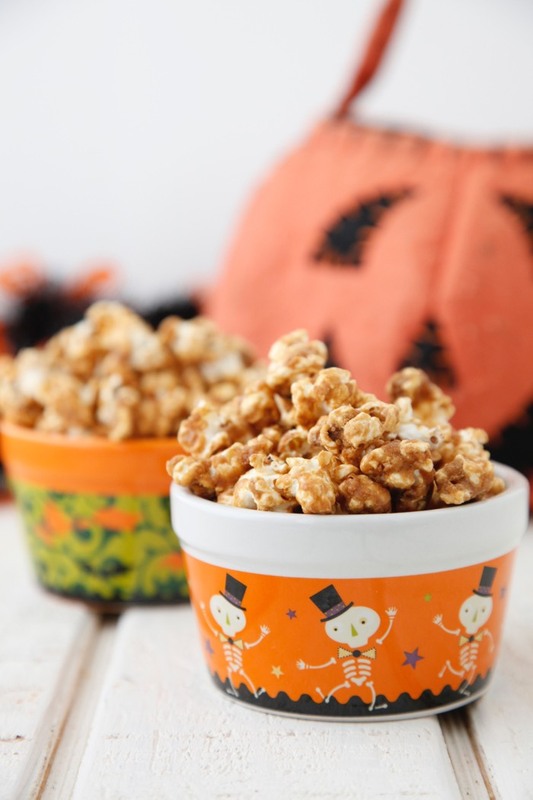 Place the popped popcorn into a large, heat-proof mixing bowl. Make sure you have no un-popped kernels in the bowl. 3. Melt the butter in a medium sized saucepan over medium-high heat. Mix in the sugar, and bring to a boil. Cook for 3-4 minutes, stirring and scraping the bottom of the pan continuously. 4. Turn off the heat and stir in the vanilla, baking soda, and salt. The mixture will bubble up a lot, this is okay. Continue stirring until the caramel is thick and glossy. 5. While stirring the popcorn, slowly pour the caramel over the popcorn. This is easiest if you have a partner help you. Stir until all the kernels are coated. 6. Spread the popcorn onto the baking sheet in an even layer. 7. Bake for 1 hour, stirring every 15 minutes, and breaking up any large clumps. 8. 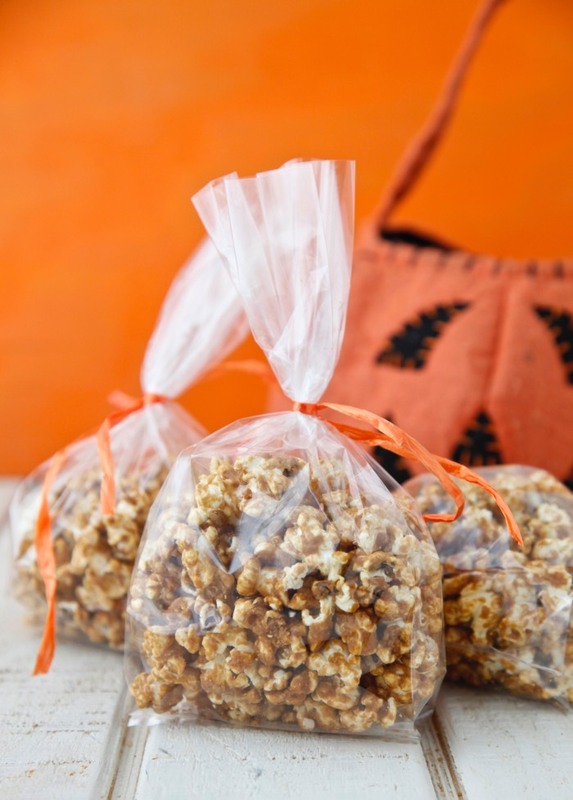 Let the caramel corn cool completely before serving. I guess you add the soda at step 4 also? What does the baking soda do in this recipe? Does it work without it? Thanks. It helps add air to the caramel mixture so that is cools and dry softer instead of rock hard. :) It is necessary. Is it okay to use organic popcorn instead? Yep. That's what I keep at home! 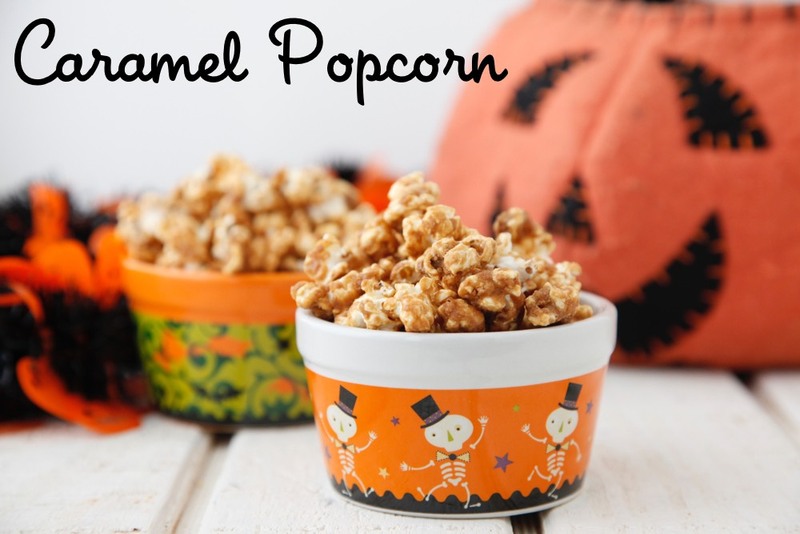 Does this result in crunchy or nice chewy caramel corn? I know most people like it crunchy but I'm always on the lookout for soft and chewy! how would you store this if you only make it for your family? In a loosely covered container on the counter top! Or in bags. oh jeez- i know how you feel- that is the worst ever- but what an awesome momma you are with all of these treats! This may be a dumb ? But can i use foil to line pan or leave unlined? I don't have parchment paper. after adding the vanilla salt and soda, my caramel separated! now I have a chunky ,oily mess. what did I do wrong?? Mine did the exact same thing today! I poured off the liquid and put what was left of the caramel on the popcorn but it didn't coat all the popcorn. I'd love to know where I went wrong too! Mine separated too. What happened? Did I over cook it? I'm curious about a new trend. I used to look up recipe and see the ingredients and directions. Now I have to scroll thro pages of personal story about the recipe, how grandma made it Or how the kids love it. I don't get it. Why do we need to all this stuff about people we do not know... When we just wAnt a recipie or direction? Not meaning to be ungrateful but stories about strangers enjoying food don't have much meaning. I totally agree. I guess there must be a reas, but it takes forever to find recipes.